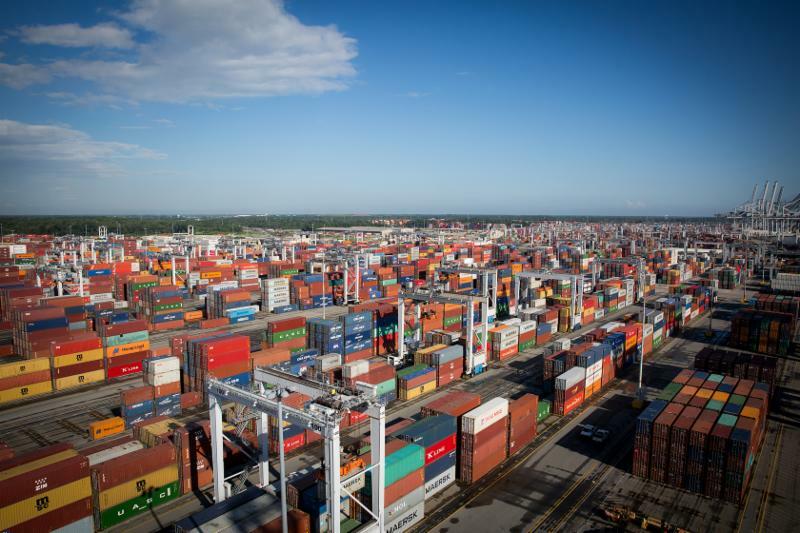 SAVANNAH, Ga., April 4, 2019 – The Port of Savannah handled more total containerized cargo and more intermodal rail volume, with greater connectivity and velocity, than any March on record, the Georgia Ports Authority reported today. The Mason Mega Rail project, which will double the Port of Savannah’s rail lift capacity to 1 million containers per year, is 25 percent complete. The first phase will come online by October 2019, and the second phase will become operational by the end of 2020. Find print-quality images of port operations here. Georgia’s deepwater ports and inland barge terminals support more than 439,000 jobs throughout the state annually and contribute $25 billion in income, $106 billion in revenue and $2.9 billion in state and local taxes to Georgia’s economy. The Port of Savannah handled 8.5 percent of U.S. containerized cargo volume and 10 percent of all U.S. containerized exports in FY2017. For more information, visit gaports.com, or contact GPA Senior Director of Corporate Communications Robert Morris at (912) 964-3855 or rmorris@gaports.com. Savannah, Ga. – December 13, 2018 – Employees of the Georgia Ports Authority helped make the holidays a little brighter for dozens of Savannah-area children Thursday.For the past 16 years, GPA employees have delivered wrapped gifts for youths in the care of Savannah Chatham Court Appointed Special Advocates (CASA). This year GPA employees provided gifts for 72 children.”The Georgia Ports is honored to take part in a program that helps children across our community who are in the most need of care and support,” said GPA Executive Director Griff Lynch. “Hopefully a small thing like a Christmas gift will remind children who may be going through difficult situations that their community cares for them.”Each GPA gift-giver sponsored a child by filling wish lists with holiday goodies. Gift suggestions included clothes, toys, dolls, bikes and games. Case workers at CASA supply the GPA with wish lists for children and youth of all ages.CASA volunteers stand up for the best interests of children who have been abused or neglected. Appointed by judges, they speak up for the child’s needs in the courtroom and community.”CASA is grateful for the ports who have sponsored more than 70 of our children this holiday season,” said Kate Blair Executive Director, Savannah/Chatham CASA. “Because of their generosity, the children we serve, will wake up to a Christmas morning they will never forget.”Holiday carolers from the West Chatham Elementary School Chorus added to the festive atmosphere Thursday.Throughout the year, CASA trains volunteers to help hundreds of children who have been removed from their homes and become entangled in an overcrowded juvenile justice and foster care system. The mission of the CASA program is to ensure abused and neglected children find a safe, permanent and nurturing home.Savannah/Chatham CASA is currently serving 185 children and the need is growing. In Chatham County during 2017, 325 children were in care. Now, just shy of 500 children are in care.For information about becoming a CASA volunteer, call 912-447-8908.